The foothills of the Yuba River watershed provide significant opportunities for conservation within the relatively intact northern third of the Northern Sierra Nevada Foothills subregion. These opportunities include protecting intact landscapes supporting important resources, such as blue oak woodlands, connecting existing protected areas within the subregion to those in the adjacent conifer-dominated habitats of the High Sierra Nevada ecological subregion, and conserving regionally important riverine habitats. The Yuba Foothills support over 137,000 acres of mapped blue oak woodlands, which intergrade with annual grasslands at lower elevations and montane hardwoods and conifers at higher elevations. 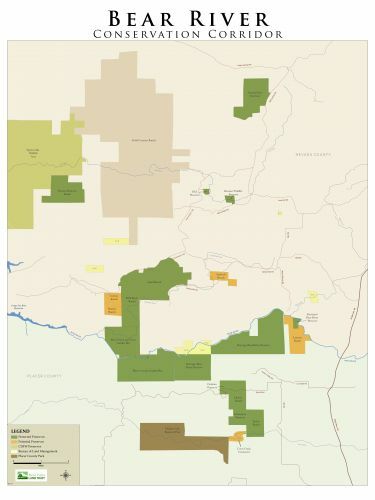 This represents 36% of the mapped blue oak woodlands in the entire Northern Sierra Nevada Foothills subregion.